Downeast Maine residents have harvested and used lobster for centuries. 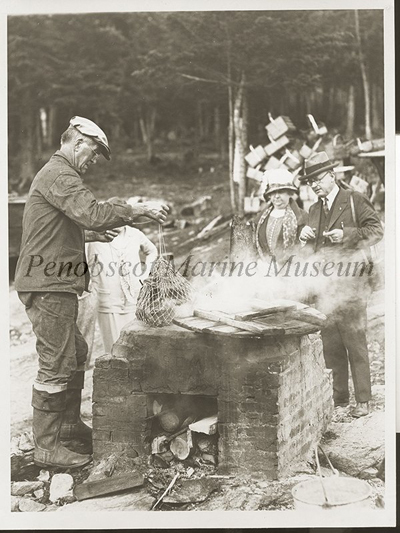 The native Wabanaki used lobster as bait for their fishing hooks (GMRI), and taught early European colonists how to use the shellfish for various purposes (Cobb 1901). 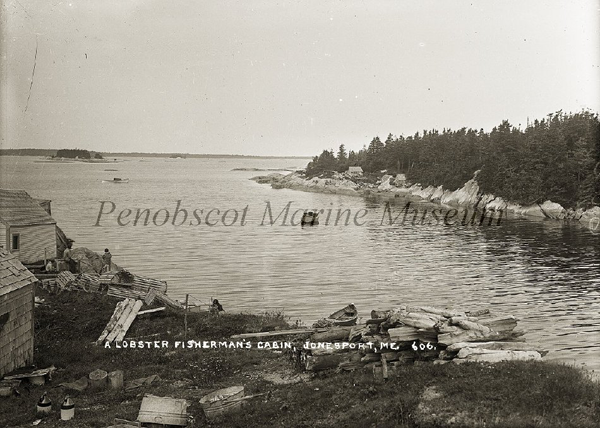 People simply walked or paddled along the shore at low tide, poked under rockweed-covered ledges and boulders, and picked lobsters up by hand, speared them with a gaff, or scooped them up with a net. 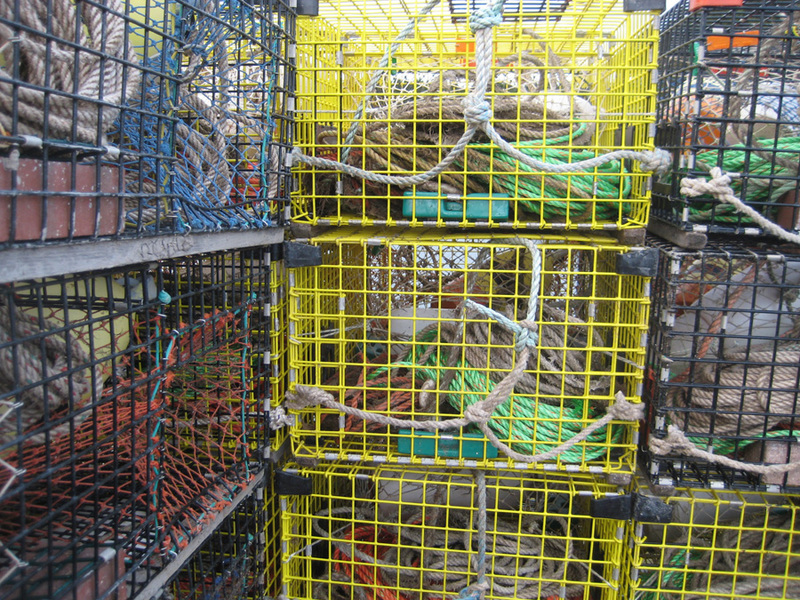 Hoop net traps followed briefly before the introduction of the wooden lath pot, baited with herring, menhaden, flounder, sculpin, or cod heads. Today, we think of lobster as a Maine icon. Yet in contrast to other fisheries like cod, lobster has been economically important only since the late 1800s. Before then, lobster was an abundant resource with little commercial value. A “cheap food,” lobster was served to widows, orphans, servants, and prisoners. Unlike the prized food it is today, eating lobster was such drudgery that Massachusetts enacted a law restricting lobster meals in prison to no more than two times a week (The Lobster Conservancy). Yet as soon as the industry began, Maine dominated. 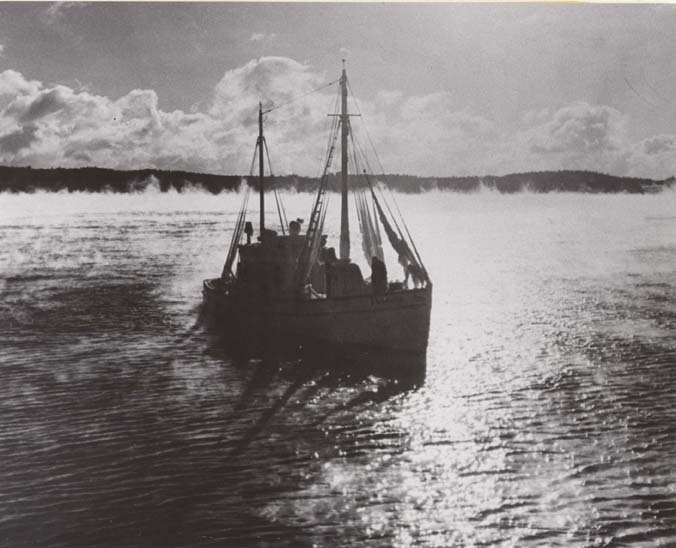 The commercial lobster fishery began in eastern Maine around 1850, when lobster smacks, also known as well smacks, began to sail north from Rockland, Portland, Boston, and New York to harvest or purchase lobster from local fishermen and bring them back fresh to growing urban East Coast markets, where they were sold boiled from street stalls. A smack is a sailing vessel that allows seawater to flush through special lobster holds, keeping the catch alive until it is delivered to market. 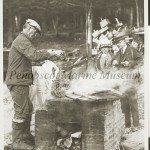 Lobsters were boiled much as they are today, and the meat from leftover cooked lobsters was pickled. Cooking lobsters for market paved the way for canning. Cooks were accustomed to getting lobster already cooked, so all they had to do was pick out the meat. Canned product eliminated this step (Oliver 1995). The first pack of sealed goods of any kind to be put up in this country was lobster, accomplished in 1843 in Eastport (Stevenson 1899). Three and one-half pounds of live lobster were required for a one-pound can that sold for five cents. 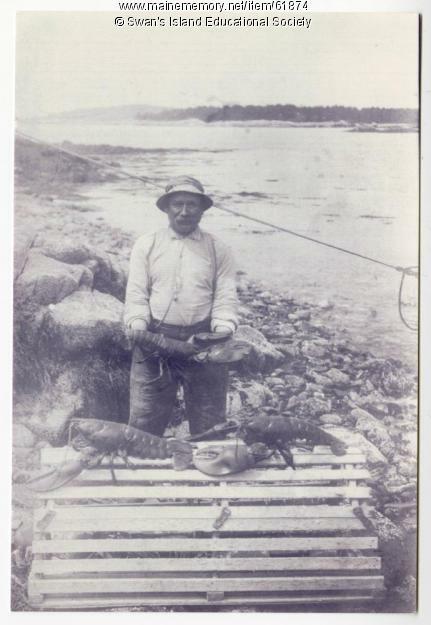 Only lobsters weighing more than two pounds were used (Cobb 1901). The lobster canning industry grew between 1845 and 1870, with a peak of 23 canneries operating in the 1880s (Rathbun 1887). Eastport had four canneries packing lobster exclusively, as did canneries in Jonesboro, Cape Split, Milbridge, and Prospect Harbor. 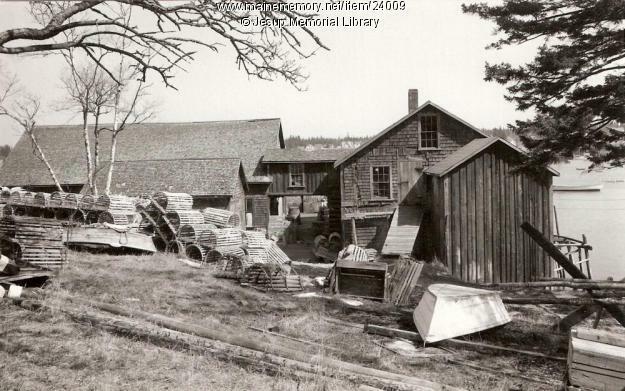 A Jonesport cannery also packed mackerel and clams. Clams were also packed at Hammonds Cove in South Gouldsboro. At Southwest Harbor, lobsters were canned alongside clams, mackerel, salmon, clam chowder, and fish chowder. The were five canneries in the Castine region, in Brooklin, Burnt Cove on Deer Isle (also canning mackerel), Green’s Landing on Deer Isle (also canning mackerel and clams), Oceanville and Castine (Rathbun 1887). In 1880, the 23 lobster canneries in operation absorbed two-thirds of the catch, shipping to Boston, New York, and other cities. In a can, lobster had become a luxury item that commanded a high price. Like the oyster, the lobster had a dual identify as a luxury food in cities and inland where it was not native, and as a food for all classes, including poor fishermen, along the coast (Oliver 1995). Canneries were an important force in transforming the lobster fishery. They refined transportation and handling procedures, and helped to diversify local economies. Canning companies boosted the reputation of Maine lobster throughout the Northeast and helped developed the first nationwide markets for the product (Judd 1988). Unfortunately, the lobster supply, at first believed to be unlimited and inexhaustible, proved to be neither. Widespread exploitation of the lobster fishery completely revolutionized Maine’s commercial fisheries and contributed largely to the nationwide popularity of the state’s seafood products; but it also caused the Maine Legislature to pass a series of restrictive laws designed to prevent the total destruction of the inshore lobster population (DMR 1978). Laws, supported by the cannery owners (Judd 1988), began in 1872 prohibiting catch of females bearing eggs, and in 1874 prohibiting catch of lobster under 10.5 inches. The lobster fishery was closed between August 1 and October 15. These laws made the canning industry, which preferred big lobsters, less profitable. Growing scarcity of the resource along Maine’s shores, the increased price of lobster, and competition from canning operations in the British Provinces of Canada all contributed to the decline of the lobster canning industry in Maine, which came to a close by 1895 (Cobb 1901, Acheson 1988). 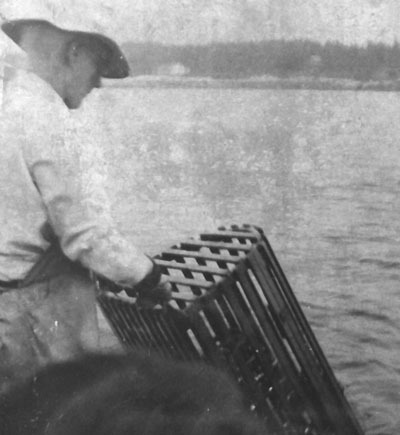 Whether sold to smack boats from away, canned and shipped, or harvested and sold locally, lobstering was commercially minimal compared to other fisheries in Maine prior to 1880. In 1876, for example, only 188 men were engaged full-time in lobstering statewide, and only half a dozen towns (including Swan’s Island, Deer Isle, and Eastport) had significant lobster fisheries before the Civil War. Lobster trailed cod, herring, mackerel, hake and haddock in quantity harvested. 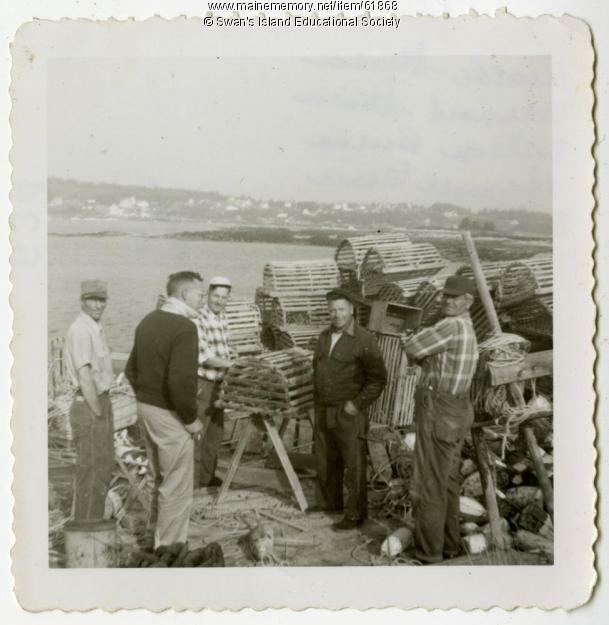 Beginning in the early 1880s, the lobster fishery expanded rapidly, and by the end of the decade, lobstering was firmly established as Maine’s most valuable fishery. What caused such phenomenal growth in the lobster industry? Lobstering was affordable. To fish for lobster one needed only a small boat, and the equipment widely used by this time (pots) could be made at home. 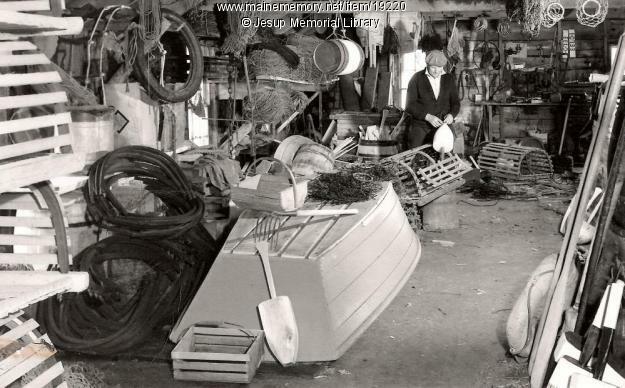 Some lobstermen, working alone, were able to make do with small, two-ton sloops—the famous “Friendship Sloops”—and others tended their inshore traps with dories. To the growing numbers of tourists, who had become more and more important to Maine’s coastal economy in the late nineteenth century, the lobster was unusual and exotic. Prices climbed as demand increased in resorts and large urban markets. Between 1880 and 1898 the wholesale value of the catch more than quadrupled on a per-pound basis (O’Leary 1996). Another important factor in the growth of the lobster fishery was the rapid decline of the cod fishery after the Civil war when many deep-sea fishermen sought work in other fisheries. Not only did the number of lobstermen increase, but so did the lobster catch, reaching 25 million pounds in 1889 (almost double the landings of 1880). After 1885, lobster pounds gradually replaced canneries, and fresh shipments became the rule. Two types of lobster pounds, fenced coves that allowed tidal circulation, and lobster “cars” or floating crates, shared the same principle: enable water to flow through the lobsters to safely store them live in enclosed pounds until the market was ready to buy them at high value. The first reported such pound was on the island of Vinalhaven in Penobscot Bay, with others in Prospect Harbor (Stevenson 1899). In 1917, a law was implemented that allowed wardens to purchase lobsters that that had extruded eggs in pounds to stop the pound owners from scrubbing the eggs off and selling them. This started the v-notch practice, in which fishermen who caught an egg-bearing female lobster punched a hole in her tail and released her back to water. Later fishermen who caught the same lobster would see the notch and know it was a reproductive female and return it to the sea.. After 1948 the round hole was replaced with a V-shaped notch mark in the tail. 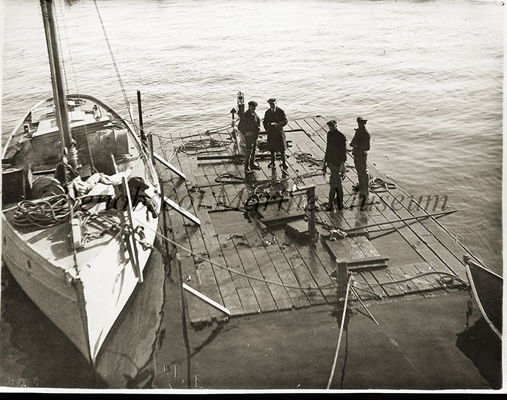 V-notching was only voluntarily, and only few lobstermen were V-notching in the early 1900s. The lobster harvest remained relatively small until the early 1940s when, for the next 40 years, the catch stablized as the price increased and more and more people joined the fishery (Acheson and Gardner 2011). Hauling wooden lobster traps by hand. Photos courtesy Maine State Archives. 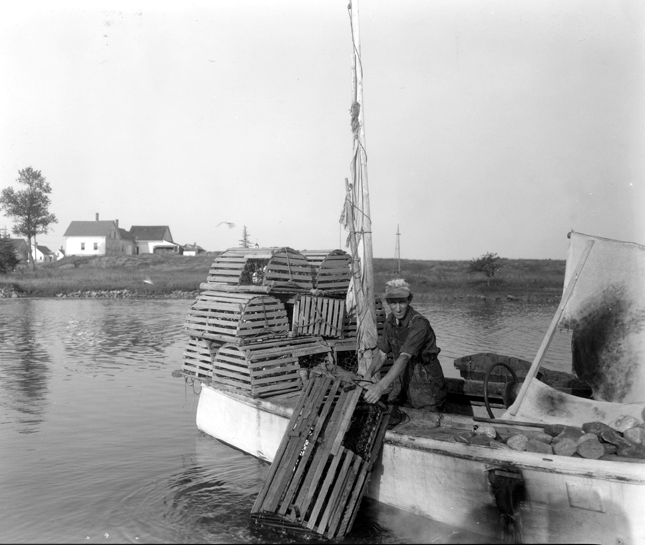 The early method of catching lobster with a net faded as fishermen started to use lobster traps made out of wood. The materials have changed over time, but the methods have remained virtually unchanged since these early traps. 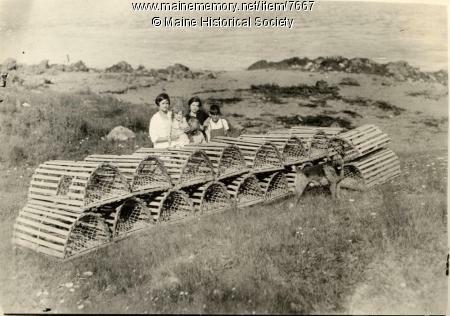 The traditional wooden lobster traps were three or four feet long and were usually built by lobstermen. 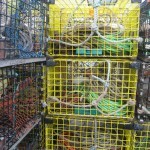 Fishermen placed bait inside of the trap to attract lobster. The traps were connected to wooden buoys by a hemp rope. Lobster boats were wooden unpowered skiffs and sail vessels. Then, the implementation of engines powered by gas or diesel made sails outdated and greatly increased the range of boats and maneuverability. As motors were adapted by fishermen in the 1930s, lobster boats became larger and faster. Due to this technological change the small, perimeter-defended territories became larger, nucleated fishing territories. Another innovation in naming and defending fishing territory was the advent of radar. This made it possible to line the offshore more effectively and not just refer to islands, underwater landmarks or named locations. Another very important technology improvement in the lobster industry was the introduction of depth-sounding equipment in 1950. This made it much easier for lobstermen to study the bottom and place lobster traps more effectively. At the same time, the hydraulic hauler was also introduced in the 1950s, enabling fishermen to much more easily haul their traps than by hand. As a result of these technological innovations in the lobster industry fishermen could increase the efficiency of their catching. After 1970, wooden boats were replaced by fiberglass boats due to easier maintenance and performance characteristics. 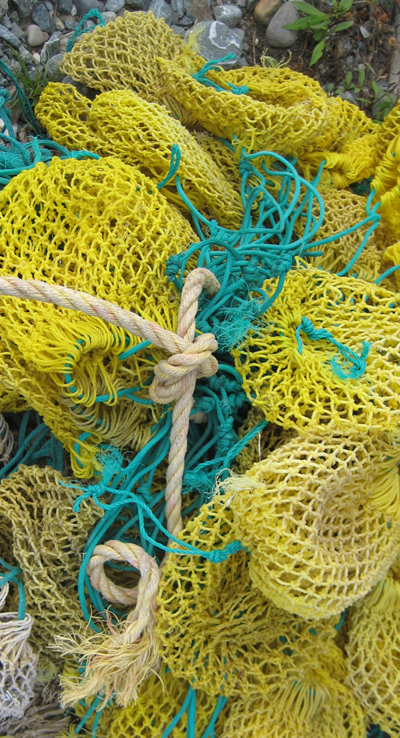 In the late 1960s and early 1970s, hemp rope and wooden buoys were also replaced by plastic rope and Styrofoam. Around the same time, during the late 1970s and early 1980s metal traps were introduced and slowly replaced wooden traps. Due to easier and more effective catching made possible by technological changes, even more fishermen joined the lobster industry despite of the large initial investment that the modern lobster boat and its equipment required. The larger catch and the increasing number of fishermen in the industry had made biologists at the Maine Department of Marine Resources and the National Marine Fisheries Service concerned about the breeding stock. Several regulations were proposed and passed by the Maine Legislature in the 1970s to avoid overexploitation and a potential for stock failure. One of these regulations set the legal size of lobster that could be taken as those larger than three and three-sixteenths and smaller than five inches in order to protect the sexually immature lobsters and the larger lobsters that made up the breeding stock (this “double gauge” concept was first proposed in 1902; Judd 1988). 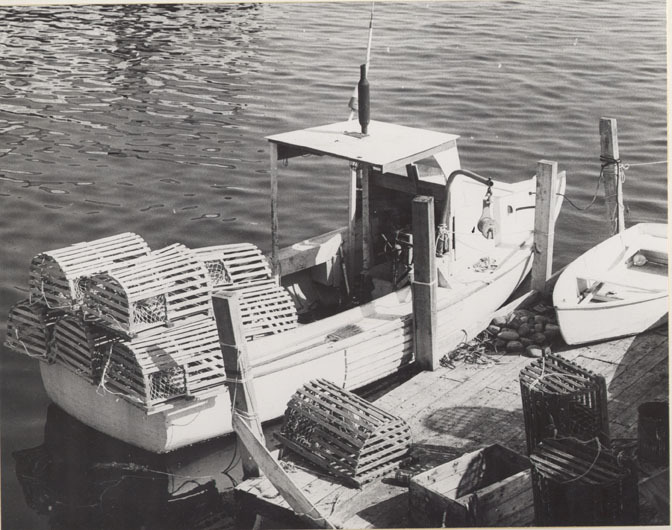 The 1974 law also required Maine lobstermen to equip their traps with a vent so that undersized lobsters could escape. In 1986 another law required the building of an escape hatch into every trap in order to prevent lobsters being trapped in unrecoverable gear. 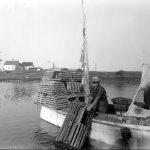 Legal lobsters were stored in crates, bushel baskets, or barrels filled with running seawater. Once caught and brought to the dock, the live lobsters were shipped by boats equipped with circulating seawater tanks to cities of the Northeast. With the development of modern refrigeration techniques and air freight, the lobster market expanded, and Maine lobsters could be exported around the world. In the 1980s an estimated 70 percent of all lobsters were consumed in restaurants and hotels, and an increasing number were sold from supermarkets (Acheson 1988). 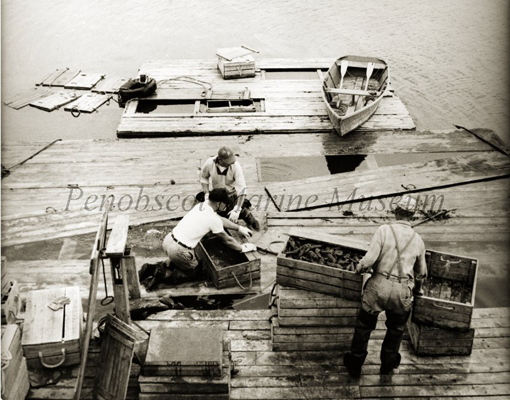 Total lobster landings in the state of Maine had been around 20 million pounds for decades before 1988. Since then, the catch has continued to increase and break records year after year both in landed value and volume. 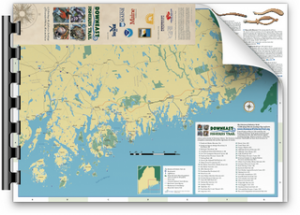 In addition to being the result of changes in the entire Gulf of Maine ecosystem, the increase is also attributed to the stewardship of fishermen. An “incipient conservation consciousness” is deep and widespread among Maine lobster fishers. Self-regulation, ultimately the only effective enforcement for an industry as remote and scattered as the lobster fishery, was and still is an important factor in protecting the lobster (Judd 1988). Acheson, J.M. 1988. The Lobster Gangs of Maine. Hanover: University Press of New England. Acheson, J., and R. Gardner. 2011. The evolution of the Maine lobster v-notch practice: cooperation in a prisoner’s dilemma game.” Ecology and Society 16:41. Cobb, J.N. 1901. The lobster fishery of Maine. Bulletin of the United States Fish Commission 19 (1899):241-265. Bayer, R., and J. Bayer. 1987. Lobsters Inside-Out. Orono, ME: Maine Lobster Institute. DMR. 1978. Harvesters of the Sea: The Story of Maine’s Commercial Fisheries. Augusta, ME: Department of Marine Resources. GMRI. “Lobstering History,” All About Lobsters. Portland, ME: Gulf of Maine Research Institute. Judd. R.W. 1988. 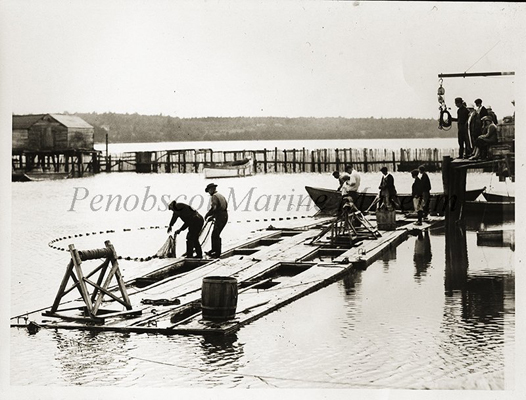 Saving the fishermen as well as the fish: conservation and commercial rivalry in Maine’s lobster industry, 1872-1933. Business History Review 62:596-625. O’Leary, W.M. 1996. Maine Sea Fisheries. Boston, MA: Northeastern University Press. Rathbun, R. 1887. The lobster fishery, pp. 658-794 in The Fisheries and Fishery Industries of the United States (G.B. Goode, ed. ), Section V Volume II. Washington, DC: Government Printing Office. The Lobster Conservancy. Lobster Biology.